The image on the left is my implementation in FileMaker. Note the broken lines. The one on the right is the image from your example file with smooth lines. Both are Arial 3 point. I'm not certain what the difference is. Verify that your line spacing is set to 0.65". Note: Since this question was resolved, IDAutomation has updated the FileMaker Native Barcode Generator products. 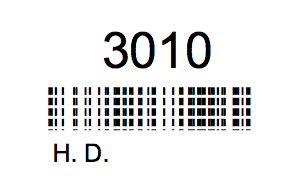 The latest version offers easier and more accurate methods of generating barcodes in FileMaker. Thomas	 Think I solved my problem. It was the line spacing. The default is 1.00 inch and I changed it to 0.65 to match your example and that solved the problem. Sorry to bother you. Thanks for being so quick to respond. Ben What is the font that you have applied? Apply Times New Roman. Ben Can you attach or post the images or screen shots?